And that is us done! Thanks for keeping with us this afternoon, it's been a whirlwind. We'll be back tomorrow for that Second City derby - I hope you can join us. Sundays in the Championship may as well be renamed 'derby day' - this month we've already had Sheffield Wednesday v Leeds, Derby v Nottingham Forest and Ipswich v Norwich. Tomorrow sees Birmingham City host Aston Villa in the Second City Derby - Blues are down in 21st, with only half the points of their Midlands rivals, but keeper Tomasz Kuszczak is clear in his message. "Our ground, our fans, our advantage. We have to be 120% on our game," he told BBC WM. You can't give any more than 100%, Tomasz, but he certainly means business! 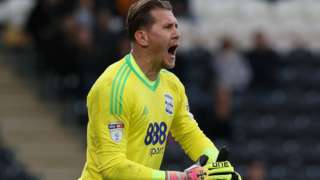 Birmingham City goalkeeper Tomasz Kuszczak says Sunday's derby with Aston Villa is the perfect showcase to "do better". A hat-trick from Kieran Dowell helps Nottingham Forest win 3-2 at Hull and move them to within a point of the play-off places. Matt Smith's header gives Queens Park Rangers an impressive victory over Wolves at Loftus Road, denying the visitors top spot in the Championship. Cardiff City fail to capitilise on Wolves' slip up, being held to a goalless draw at home by Millwall. Bristol City move back up to fourth with a fine win at Sunderland thanks to Milan Djuric's second-half goal. Fulham deny bottom-of-the-table Bolton victory with a stoppage-time equaliser, while Ipswich come from behind to beat another of the strugglers Burton. Middlesbrough score a goal either side of half-time to win at Reading, while Sam Winnall gives Derby victory at Norwich. I thought he [Dowell] was magnificent - clinical and very good on the ball. We're a relatively new squad and I feel like we're just starting to click now, there's a lot more to come. I've been missing a few chances lately, so it was nice to see them hit the back of the net. It's like buses, they all come at once. It's either sublime or ridiculous, competitive or mediocre depending on which way you look at it, because from Fulham in 13th to Aston Villa in sixth, the gap is just three points. Forest are ONE point shy of the play-offs... not bad given I described their form as mixed before kick-off. Nottingham Forest come away with the spoils from an open mid-table tussle at the KCOM Stadium against a Hull City side on a bit of a revival. Kieran Dowell will get the headlines, rightly, as he looks a special talent and got a hat-trick too. Stunning. Hull City fought hard but alas, it was in vain. Leonid Slutsky is pacing like a bloke waiting for a bus that's half an hour late. Visible vexation. Looping header bounces wide of the post from a Hull City free-kick... Forest running down the clock. Hull pumping the ball forward, Forest sweeping it away. Liam Bridcutt and Jamie Ward go down, scrabbling desperately. Kieran Dowell and Tyler Walker flash shots on goal but Hull survive. Hull clawing, and clinging on desperately to this game as Michael Hector slams in after Forest failed to clear. Hope renewed slighty... two minutes plus added time! Jamie Ward is on for Forest, all impish hassling and harrying. Hull throwing caution to the wind and whatever they can find (other than tennis balls thankfully). Ward arguing with a couple of Hull players. You don't say. Having smashed in a couple of Goal of the Month contenders, Kieran Dowell's treble is brought up from the spot where he had no trouble slotting past Allan McGregor. Last time Forest had a fella with a left foot that good, they won the European Cup. Or at least the Zenith Data Systems Cup. Hat-trick, a first one with it. ...then suddenly Tyler Walker hares into the box and is hauled down! Forest to go three up? I'm certainly not trying to turn this into an episode of a reality TV music show where everyone has to have a tear-jerking sob-story, but it is heartening to hear tales like that of Jarrod Bowen. Came from Hereford, and looks right at home in this division. Hull piling forward now. Forest under t'pump. 10 t'go. Only one word for that from Jarrod Bowen. Beltin'. Hull, provoked into a response by that ripper from Dowell a moment ago, find a foothold in the game. Bowen has been a threat all night on the right and as he crabbed across the edge of the box, he unfurled a peach, bending beyond Jordan Smith to open things up once again. Two super strikes have Nottingham Forest in complete control at the KCOM Stadium and it's the Everton loanee Kieran Dowell with the magic touch once again. Forest worked it out wide right, and a sweeping crossfielder picked out Barrie McKay in the box. He brought the ball down and volleyed a cushioned pass to Dowell - whose sweetly struck first-time effort clipped the post and nestled in the opposite corner. Poetry in motion. Forest comfortable. Hull frustrated. Jason Cummings' damp squib shot brings up the double substitution and marks the end of his night, as Tyler Walker - son of the legendary Des, comes on. Andreas Bouchalakis comes on too, for David Vaughan.